Today, we want to present you one more tool allowing online store owners to organize order processing more efficiently. Out of the box, Magento order grid doesn’t let users remove or hide unnecessary orders. 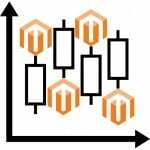 The Amasty Delete Order Magento 2 module is a solution that expands some lacking functions in default Magento 2. Delete Order for Magento 2 provides the ability to delete particular orders with all related information, as well as move orders to archive and save them in a separate grid. Below, we explore the module’s features, as well as describe how they work on the backend. Admin notifications on order archiving. 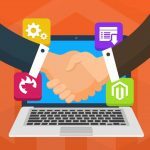 After installing the Magento 2 Delete Orders extension, you will drastically improve order management on your web store. There are two options to organize unnecessary orders depending on your needs. The first way is to completely remove orders with the related information from the orders grid. The second option offered by the module is to send orders to archive. When arranging orders on your store, keep in mind that delete action is irreversible. As for orders archiving, you can remove specific orders from the orders grid and move them to a separate grid. Archived orders can be restored or deleted permanently later. This way, you create order data backup that you can move back to the orders grid in a few clicks and use it when needed. Besides, it is possible to automate order archiving to cut the time spent on order management and routine tasks. You can set a period in days after which orders will be moved to archive automatically. For example, if you have a massive list of orders from the last several years, you can specify archive period as one year to keep only the latest orders on the grid. You can use the archiving frequency to arrange your orders in the most suitable way. Also, it is possible to manually archive orders at any time using cron job actions. Moreover, automatic order archiving can be based on the selected status. For instance, you can set completed and closed order status to trigger archiving procedure. 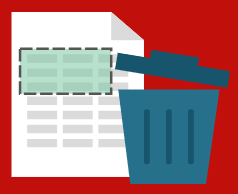 The Magento 2 Delete Order module enables merchants to hide archived orders on the frontend. If this function is activated, customers will not see archived orders in their accounts and will get only actual information about their orders. With the extension, you can also use API to organize your order archive, so that you will be able to delete, archive, and recover orders without the need to go into the Magento Admin. Another opportunity offered by the module is related to email notifications system. Admin users can receive notifications on each successful order archiving. To configure main settings of the Magento 2 Delete Order extension, navigate to Stores -> Settings -> Configuration -> Amasty Extensions -> Order Archive. The module’s configuration consists of three tabs: General Settings, Email Notifications, and Force Cron Job Actions. In General Settings, you enable/disable the extension and decide whether to hide archived orders in customer accounts. Also, here you specify the period in days after which orders should be archived, select order statuses for archiving, and set the archive frequency: hourly, daily (one or two times per day), weekly, or monthly. 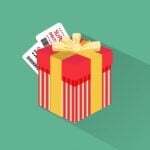 In Email Notifications, you choose whether to notify your store admins on successful archiving, enter an email address for sending notifications, and select email template. The Force Cron Job Actions tab allows you to start archiving process manually when needed. Delete Order for Magento 2 lets users delete and archive particular orders on the Orders grid page under Sales -> Operations -> Orders. The module adds new options to the Actions drop-down: Add To Archive and Delete Permanently. It is possible to archive and delete orders in bulk. Archived orders are forwarded to the separate grid which you can find under Sales -> Amasty Order Archives -> Orders. On the Archive Orders grid, it is possible to restore selected orders by applying Remove From Archive action. This command moves the order back to the Orders grid. Here, you can also permanently delete archived orders. The Magento 2 module also provides the ability to export all records from the grid into a CSV or Excel file. 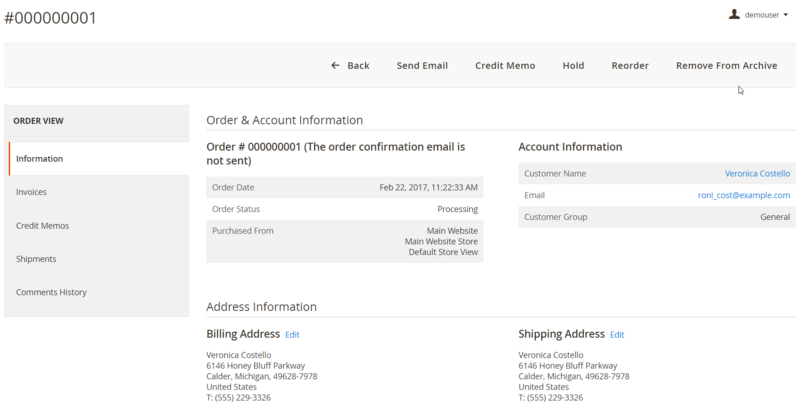 By clicking View in the Action column, you can open the details of a specific order. It is possible to restore an order using the Remove From Archive function on the Order View page.